We have a bit of a thing about compound words in our family. It started with Monkey, who decided he liked them a couple of years ago, and got in the habit of noticing them and commenting on them in everything he read. 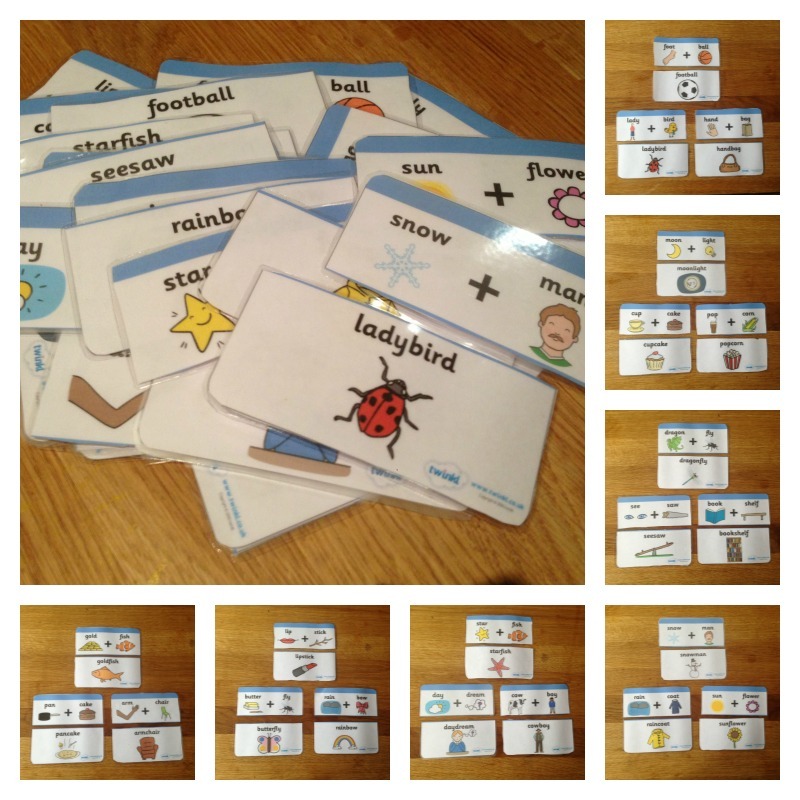 At that time we made a compound word card game and played it quite a lot for a while. 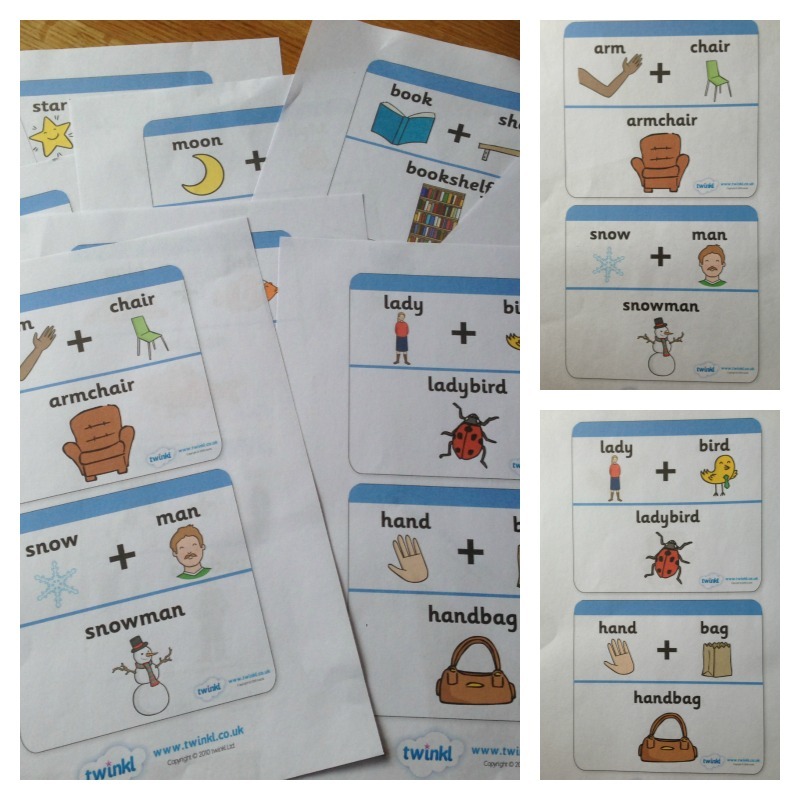 Rabbit is now showing an interest in compound words too, so when I saw this version on twinkl I was very keen to try it. 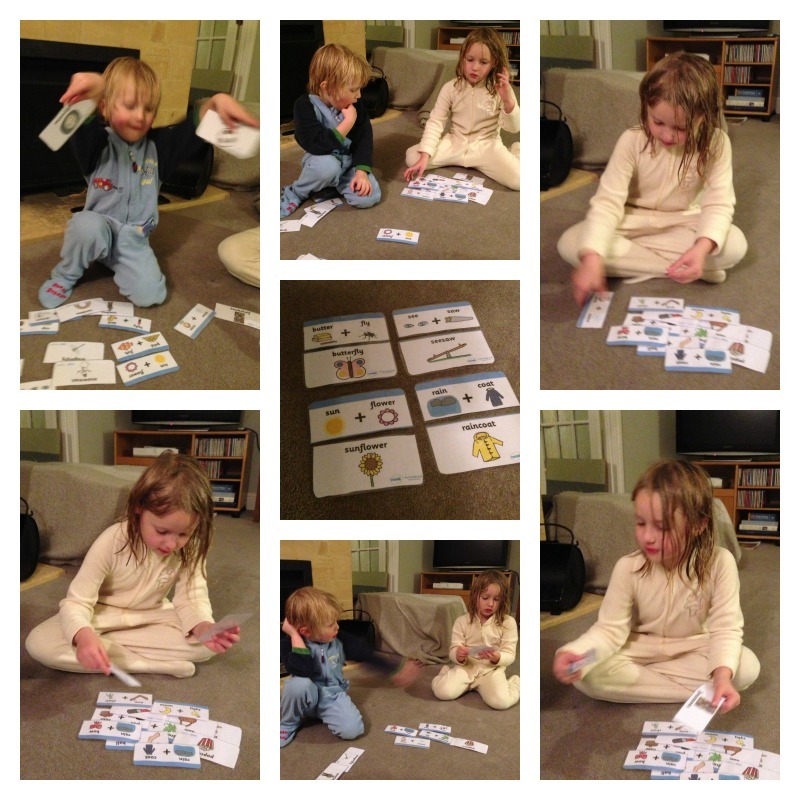 I asked Owl and Monkey if they would like to make the game for Rabbit and Tiddler, and they cut out the cards with only a very little help from me. Then we laminated them all and I cut them out again. After that Monkey matched up all the pairs to check that they were all there before giving them to the little ones. We have devised our own rules for playing the game. We mix all the cards up and share them out between the players. Then the first person chooses one of the cards with a plus sign on and places it in the middle (for example sun + flower.) The next player looks for the matching card (sunflower) and if they have it they can keep that pair, and if not they add another card to the middle. We take turns until all the cards have been paired up, and then see who has the most pairs. Or sometimes we don’t get as far as counting. When we were playing today, Tiddler said to Rabbit “I won last time, so you can win today, then Mummy can win next time!” However, when we finished he declared “I won” without counting and then mixed all the cards up. Luckliy Rabbit wasn’t too bothered! We have really enjoyed making and playing our compound word game. It’s a lovely indoor activity for rainy days, and perfect for just before bedtime as you can see from the photos above. We have also managed to get out of the house for an Autumn leaf hunt yesterday (using a twinkl checklist) and for a little bit of Leaf Art today – it’s late now and I’m tired so that will have to be another blog post for another day! This entry was posted in English and tagged compound words, twinkl on October 22, 2013 by Hannah.